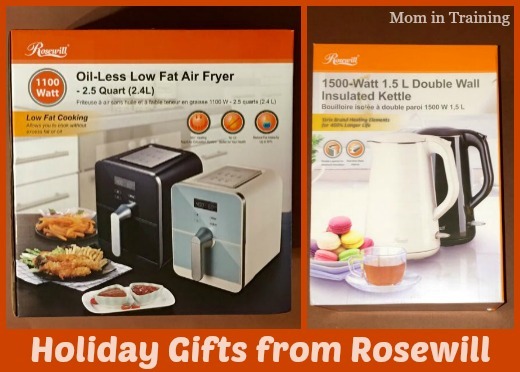 Just in time for the holidays Rosewill unveiled two new products in their line perfect for holiday gift giving. The 1100W Oil-Less Low Fat Air Fryer and the 1500-Watt 1.5 L Double Wall Kettle are two products I know have been welcomed in my kitchen already. I love being able to have a kettle of hot water ready for my kids when they come in from playing outside. Now they can make hot cocoa on the spot and not have to spend time waiting for their turn to heat water in the microwave. As for the oil-less fryer it's an item that's been on my list ever since they were first introduced. So far I've only had the chance to make some chicken in it and am already loving how it works. Not having to use fatty oil to deep fry my foods is such a big plus. I actually got rid of my deep fryer years ago because I didn't like preparing greasy foods in it for my family. I'm really excited about all of the possibilities with this new oil-less fryer! Rosewill’s RHAF-15001 air fryer is a triumph in cooking technology, ensuring seasoned flavors without grease, oil or fat typically associated with fried foods. Designed with a glass panel and LED display, users can program the air fryer for a number of guilt-free foods. Double protection circuits hold up against frequent use, and its sturdy, lightweight structure make it easy to use, clean and store anywhere. In addition, the rapid air circulation system ensures an even, thorough and healthy cooking process. The stylish and easy-to-use RHKT-15002 electric kettle features a 1.5L capacity and brings water to rolling boil in minutes with 1500 Watts of power. With a double-layer insulated design, this electric kettle stays cool on the outside while heat is retained on the inside to keep water hot longer. Created for ease-of-use, users simply fill it with water and push the On/Off toggle. For safety purposes, it shuts off automatically when the water is boiled and will never boil dry. I would love to have the electric kettle. It would be great for hot chocolate and tea when it's cold outside.